Scandinavia is world famous for many things. However, when most people think of these Nordic countries (including Norway, Sweden, and Denmark), frigid winters, tons of ice and snow, and dark, cold days are usually what come to mind. 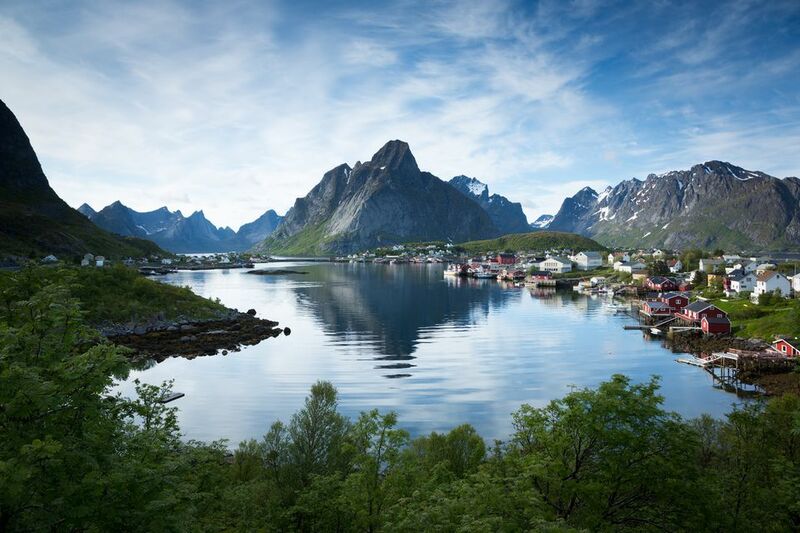 Seasoned travelers will tell you that April is the month in which you should travel to Scandinavia. It is still off-season, with low travel prices, and with warmer weather arriving, you can expect to find spring flowers and green landscapes. Unfortunately, Scandinavia's skiing season is over in most locations. However, warm weather activities are just beginning. At this time of year, polar nights (24 hours of darkness) are still the norm, and thus, you may still get a chance to see the Aurora Borealis (Northern Lights) until mid- or even late-April. By April, the harsh winter weather in Scandinavia finally begins to subside. Temperatures become warmer by the day, but the climate is still somewhat unstable. The average temperature is typically somewhere between 39 degrees Fahrenheit (4 degrees Celsius) and 50 degrees Fahrenheit (10 degrees Celsius), regardless of where you visit. There are occasional late winter and early spring storms in Scandinavia's coastal regions, but by mid-April, flowers are beginning to bloom and are usually visible around Easter time. Travelers can expect some rainy days and some days full of sunshine as the weather is highly unpredictable during this season. Days rapidly increase in length now, and you can expect approximately 13 hours of daylight each day. Though it is technically springtime, you will still need to pack warm winter clothes for a trip to any country in Scandinavia. Since mornings and nights can still be rather cold, it is advisable to bring along heavy sweaters and sweatshirts, a warm winter coat, as well as lighter items such as T-shirts, so you can layer clothing easily and comfortably. Furthermore, pack a raincoat and windbreaker. These items, regardless of the season, are always a good idea to bring along. Weatherproof shoes are also essential for a Scandinavian trip if you want to enjoy outdoor activities, as well as comfortable walking shoes for exploring the cities. April in Scandinavia kicks off with Easter and Holy Week holidays, but there are plenty of other events for travelers during these months, too. Movable holidays this month are the Easter and Holy Week holidays including Palm Sunday, Holy Wednesday, Good Friday, Easter Sunday, and Easter Monday. Maundy Thursday, the fifth day of Holy Week which commemorates the Maundy and Last Supper of Jesus Christ with the Apostles is also widely observed throughout Scandinavia. Queen Margrethe II of Denmark's Birthday: On April 16, the Dutch celebrate with a procession and gala, usually in Copenhagen. Voss Jazz Festival: Norway celebrates the genre during the first week of April. The event is marked by three days of jazz and folk music performances. Walpurgis Night (Walpurgisnacht): This holiday takes place on April 30 in Sweden, Denmark, and Finland, the nearby Nordic country. This holiday is named after the English missionary Saint Walpurga. Walpurga's annual feast was held on the first of May and thus, she became associated with May Day, particularly in the Finnish and Swedish calendars. Walpurgis Night is now celebrated on the eve of May Day with lively dancing by Walpurga's fans. Bergen International Festival: Bergen, Norway, kicks off its two-week long event in late April. You will find a wide variety of performances including music, dance, literature, visual arts, folklore, and more. The first festival was started in 1953 and has been growing ever since. Spring is a popular time for lamb dishes, and it's also the time for the season's first potatoes, green garlic, asparagus, and other delicacies, so be sure to enjoy them. Outdoor bars, cafés, and terraces throughout Scandinavia begin opening up in April, but for many, you'll still need a blanket or a heater to enjoy them thoroughly.